Is your family ready to hit the road this summer? Before you begin any adventure, it is important to assure that your family is both safe and comfortable no matter where they roam. While some vehicle shoppers may say that owning a smaller vehicle is more fun and fuel efficient, who wants to travel for hours on end in a cramped vehicle without the amenities to keep everyone comfortable and entertained? Instead, if you are one of those families who prefers luxury on wheels, you are in luck. We have done the research and located the best 8 passenger SUVs available today. Listed as “one of the Best Midsize SUVs” this year by the experts at Edmunds.com, the 2018 Toyota Highlander offers ample space, a smooth ride as well as some of the best standard amenities available. Along with seating for eight passengers, this Toyota SUV also offers all wheel drive, blind spot monitoring, a rear cross-traffic alert system, adaptive cruise control, pedestrian detection, 360-degree parking camera, hands-free Bluetooth technology, built-in navigation as well as the Driver Easy Speak system, which allows the driver to talk with backseat passengers without having to ever take your eyes off of the road. Tack on an available V6 engine, which is capable of up to 295 HP and 263 lb.-ft. of torque, as well as a height-adjustable power liftgate that leads to ample cargo room and you can rest assured that this SUV will get you, your family and all of your necessities wherever they need to go. Ranking right behind the all-new Toyota Highlander as one of the best eight passenger SUV’s is the 2018 Honda Pilot. Listed as one of the “Best Family SUVs” of the year by Edmunds, the Pilot offers one the most spacious third rows in the midsize SUV category. Much like the Highlander, the new Honda Pilot also offers a powerful V6 engine that is capable of more than most in its class. 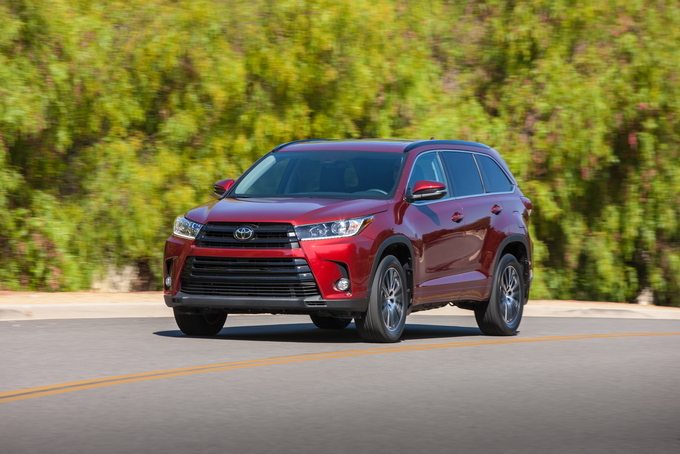 Unlike its predecessor, the Pilot offers this beast of an engine standard, where the Highlander’s V6 is offered as an option – meaning more money out of your pocket for power. This SUV even offers up to 5,000 lbs. of towing capacity to get that popup camper to the beach or that pair of jet skis to the lake. Unlike the Highlander, the family-friendly Pilot is also equipped with added technology like Apple CarPlay, Android Auto and Pandora internet radio compatibility that are sure to keep your teens or tweens plugged in and entertained. This SUV also offers added entertainment options like a rear entertainment system that includes a Blu-ray player with a single overhead screen. Why would any mom want to own a SUV that doesn’t include all of the latest safety features? Fortunately, the Pilot includes features like a full blind-spot monitoring system with rear cross-traffic alert, front and rear parking sensors, forward collision warning, lane departure warning and intervention as well as Honda’s LaneWatch blind-spot camera. This is sure to keep both parents happy and breathing easy. If you are in the market for an eight passenger SUV that is both fun and has the ability to handle any terrain that you have in mind, then you just might be in the market for a vehicle like the 2018 Toyota Land Cruiser. As our friend’s at Autotrader say, “This iconic four-door off-roader is effectively the last of its kind”. Why so? Because this SUV is one of the few that is still built on a rugged truck-based platform. The biggest benefit to this platform is that it now blends the dimensions of a typical family-friendly SUV with one of the best off-road vehicles available. Although there may be some who are concerned about lack of comfort, this hill jumper actually offers an unpredictably reassuring ride. Thanks to this platform, the upgraded Land Cruiser also offers a vast cargo space. The downside to this eight-seater SUV is that it lacks the luxury and technology enhancements of most in its class. Despite this downside, if your family consists of a dad who loves to drive with his household of boys then this SUV might be the perfect choice. If you are a stylish family on the go, then you might want to check out the 2018 Chevrolet Traverse. Built with a 3.6-liter V6, this eight passenger SUV offers up to 310 HP. Thanks to its tight chassis and superior maneuverability, this easy to drive SUV also assures that those hard-working moms out there can get in and out of car pool and those tight grocery store parking lots with ease. If your family needs a SUV with more interior space and cargo room, then you might also want to consider the all-new Traverse. With enough room for both small and large items, more legroom as well as hidden compartments throughout your family just might this vehicle to enjoy the daily drive or any adventure that you might have in mind. For those who are in the market for style with a bit more towing capacity, you might also be interested in the 2018 Buick Enclave. Much like the Chevy Traverse, Buick’s second-generation SUV Crossover now offers a more stylish exterior, a longer wheelbase than ever before as well as a towing capacity of up to 5,000 lbs. So, if you want to take that upcoming camping trip, with your popup camper, in style then you just might want to check all the slimmed down, but mighty Buick Enclave. Thanks to available sound deadening materials, the Enclave even offers a peaceful ride despite towing something heftier than most might expect. Although this SUV Crossover offers more cargo volume than most, there is something missing – seating capacity. While most of its competitors include seating for eight, this SUV only includes seating for up to seven passengers, with more hip room than most. Are you one of those people who prefers owning a vehicle that wins all of the popularity contests? If you answered yes to this question, then your ideal choice of eight passenger SUVs just might be the 2018 Chevrolet Tahoe. Known as “America’s best-selling SUV”, the Tahoe has also been named the “Most Dependable Large SUV” on the market today. Much like Toyota Land Cruiser, this SUV is built on a truck-based body-on-frame construction, which offers plenty of comfortable seating for up to eight passengers as the ability to take on any terrain. An optional 40/20/40-split bench seat can even give you room to add one additional passenger. With 94.7 cu. ft. of available cargo space as well as an available 4G LTE Wi-Fi connection, just might put you and your kids at ease when it comes to planning your next vacation. Like most Chevy trucks, the popular Tahoe SUV also offers a large, powerful engine that gives it one of the largest towing capacities (up to 8,600 lbs.) in its class. This SUV’s best-in-class V8 also offers a fuel economy rating of 23 MPG Hwy. Despite the awards, there is a downside to this new SUV. While this vehicle might be ideal for all of the off-road adventures that you have in mind, it might not be the most comforting for all of those high-class city adventures, due to its lack of ability to take on those tough corners or parking lots. Another eight passenger SUV that has racked up points in the family-friendly popularity contest is the 2018 Ford Expedition. Winner of the U.S. News & World Report’s “2018 Best Large SUV for Families” award, Ford’s signature SUV offers a long list of qualities that may peak your interest. Along with tons of ample space for eight passengers and ample cargo, the new Ford Expedition also offers safety features like a 360-degree camera, adaptive cruise control, lane keep and departure assist, pedestrian detection and even automatic braking to keep everyone around your vehicle safe. Unlike the Tahoe, the Expedition provides a smooth ride no matter the terrain, which means that it can handle both off-road adventures as well as any tight city streets that you encounter. While the majority of the best eight-passenger SUVs are targeted to those families who are on a budget, there are those of you who might be in the market for a luxury SUV where cost is of no concern. If this is you, allow us to welcome you to the battle of the family-friendly luxury SUVs. In one corner sits the vehicle that many consider the reigning Luxury SUV Champion – the 2018 Cadillac Escalade. Powered by a premium V8 engine, the all-new Escalade offers up to 420 HP and 460 lb.-ft. of torque. Along with what some call a dominating exterior, this premium SUV also offers large premium leather seating throughout with three-way massage modes, lots legroom than its competition, a brightly lit customizable dashboard, a 360-degree view camera and even a small refrigerator in the center console to keep all of those snacks and drinks fresh for the long ride. This Goliath type vehicle also includes amenities like a wireless phone charger, an eight-inch touchscreen interface with navigation, tri-zone climate control, heated/cooled seats, rear entertainment system with four screens, foot powered tailgate and 15.3 cu. ft. of luggage space. This space can even be increased to 94.7 cu. ft. by folding the second and third row seats, which is easily accomplished with the push of a button. In the other corner is a luxury competitor that seems to be giving the newest Cadillac Escalade a run for its money. For those who are cool with not living up to the status quo and receiving a return on your investment, may want to consider the ultra-luxury eight passenger 2018 Lincoln Navigator. The vehicle that many in its class may not have seen coming offers more cargo, legroom and even seating adjustments than its competitor. Although the Lincoln is powered by a smaller V6 engine, this model uses an upscaled twin-turbo V6 that actually offers a bit more horsepower and torque than the Cadillac (450 HP and 510 lb.-ft. of torque). While not offering quite the top fuel economy that the Cadillac does, the Lincoln put more effort into its inside amenities, including a larger, more user-friendly touchscreen interface as well as an easier, more technologically friendly entertainment system throughout. While there are a myriad of options available when trying to choose the best eight passenger SUV, the best way to make the perfect choice for you and your family is to take a few much needed steps. Determine a Budget: This is the easiest way to narrow down the field. So, before getting behind the wheel of any of the vehicles on this list be sure to decide how much SUV you can afford. Most Needed Options: After determining a budget, start thinking about what options you and your family are most in need of. How Will this Vehicle be Used: Last and most importantly, deciding what this vehicle will be primarily used for, including family adventures, your child’s baseball team convey or for your family’s everyday needs will make the choice easier than any other. After narrowing down the field, it is time to schedule a test drive in each of your top eight-passenger SUV choices.